Guzzlord in game: 515 Who? Important notice! 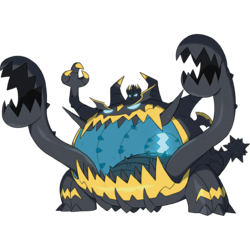 Pokemon Guzzlord is a fictional character of humans. Guzzlord (Japanese: ?????? Akujikingu) is a dual-type Dark/Dragon Pokémon introduced in Generation VII. It is one of the Ultra Beasts and is known by the code name UB-05 Glutton (Japanese: UB05 Gluttony). Guzzlord is a large, dangerous Pokémon and is one of the Ultra Beasts. It has a large mouth right at the center of its belly, with several sharp fangs on the top and bottom jaw. Its insides are blue and within is a black tongue, along with several spikes. It has a small opening to the rest of its innards. It has two small arms located on the top of its head and has three digits with yellow claws. What appear to be a pair of large pincers are in fact extensions of its tongue, used to grab and consume anything or anyone nearby. Two small openings at the ends of its mouth allow these tongue-pincers to remain extended even when its mouth is closed. It has a pair of thick legs that have a yellow zigzag pattern on its knees. It has several wing-like protrusions around its body, with a tail which resembles a medieval mace. It has blue eyes. On the top of its head appears to be a smaller head, which also has blue eyes, with several yellow tipped spikes. According to reports, this Pokémon has gobbled up mountains and swallowed buildings whole and will eat absolutely anything else it can reach, including the very land and sea. Although it constantly eats, its droppings have never been found. It is speculated that the entirety of the matter it consumes is converted into energy, with no waste products left over. It has gobbled mountains and swallowed whole buildings, according to reports. It's one of the Ultra Beasts. Moves marked with a superscript game abbreviation can only be bred onto Guzzlord in that game. 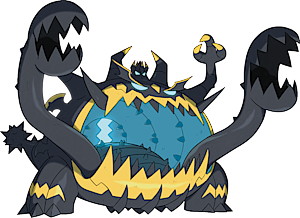 Guzzlord has the highest base HP of all Dark-type and Dragon-type Pokémon. Guzzlord is the heaviest Dark-type Pokémon and the heaviest Dragon-type Pokémon. Due to its habit of eating almost anything but not excreting anything out, Guzzlord may be based off a black hole. It also resembles a crab. Guzzlord may be a combination of guzzle (to eat or drink in a greedy manner) and lord. Akujikingu may be a combination of ?? akujiki (consumption of repulsive things), ? aku (evil), and king.